In a joint operation between South African National Parks (SANParks) Environmental Crime Investigators and rangers, the South African Police Services (SAPS) and South African National Defence Force (SANDF) this morning three suspected rhino poachers were thwarted while trying to escape in the Crocodile Bridge Ranger Section of the Kruger National Park (KNP). The team initially spotted two rhino carcasses already dehorned (cow and calf); and upon follow-up investigations came into contact with the three armed suspected rhino poachers. A shoot-out ensued, which led to one suspect being fatally wounded and the other two arrested. The team also recovered four fresh rhino horns, a hunting rifle and an axe from the poachers. 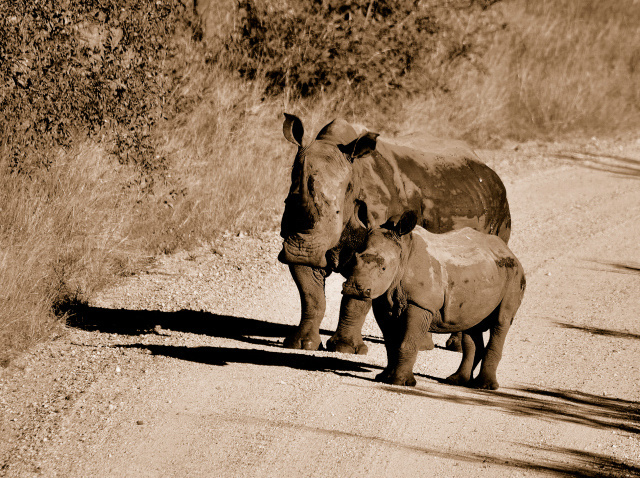 “It is unfortunate that we could not save the rhino cow and calf in time but we are convinced that with the increased measures we have in place; the poachers are feeling the pressure and our concerted efforts are not in vain as the number of poaching arrests continues to rise”, said SANParks’ Acting Head of Communications, Paul Daphne. Since January this year, 130 rhino have been killed in the KNP and a total of 31 suspected poachers have been arrested in the KNP. Daphne made a further request to members of the public to continue assisting authorities by reporting any suspicious behaviour. “We will continue to intensify the anti-poaching efforts and this latest developments represents a success in our combined efforts with the various law enforcement agencies.